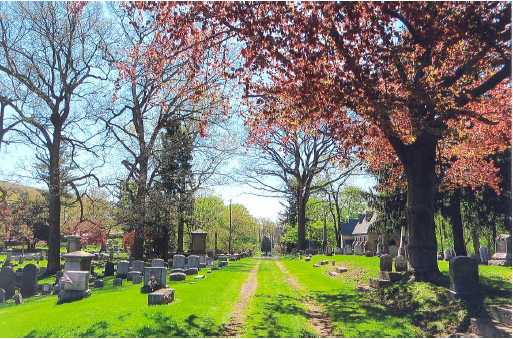 The grandness and transformation of nature as it cycles through its four seasons is elegantly exhibited in the twenty plus acres of the Charles Baber Garden Cemetery. 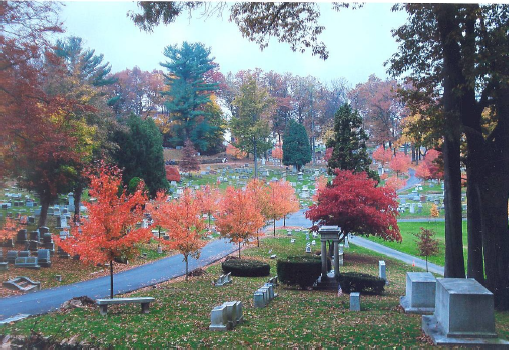 No matter in which of the four seasons one visits the cemetery’s garden grounds, nature’s affect on the trees, shrubs, small animal life and birds is impressive to behold. 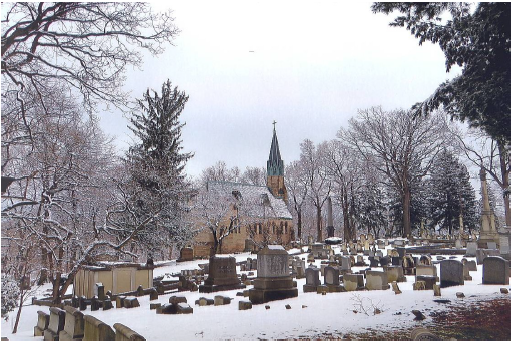 The Baber Cemetery begins its year wearing the white of winter snow. The snow is accompanied by freezing temperatures, sleet, ice, howling winds, sunshine or dreary overcast skies. Even in blizzard conditions, there is a quietness, serenity, beauty, and solitude about this season. Gradually the weather warms, and spring arrives. 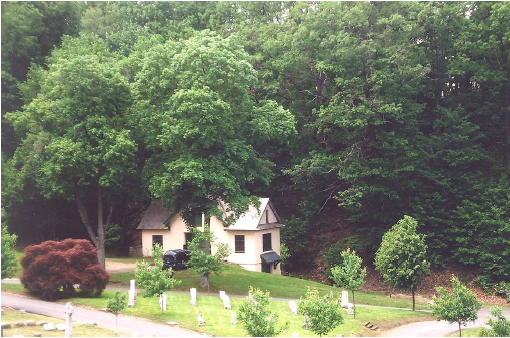 Many shades of green appear throughout the garden cemetery as trees and shrubs blossom and then unfurl their leaves. Some trees, like the dogwood, emerge in cloaks of pink and white, while others, like the maples, display mantels of red. The cold spring rain becomes warmer and multiple bird life appear. The violets, tulips, magnolias, and azaleas are dressed in their purples, reds, and pinks. Everything seems new, fresh, and alive. The daylight hours are growing longer. The weather continues to warm up and soon the hot days of summer arrive. But, the many shade trees and evergreens provide a cool, refreshing respite from the heat of the sun. Butterflies appear frequently at the pond. Summer church services can be heard on a Sunday morning in the Chapel of the Resurrection. Hawks may be seen sitting on the cross of the chapel or calling to each other from tree limbs high overhead. A woodpecker is heard somewhere in the trees. By September, the hot weather and concern of drought conditions begin to fade as cool nights rush in and temperatures start to drop. With the cooling temperatures, the tree leaves begin to turn from their fine greenery to shades of orange, yellow, rust, and gold. They are dazzling to behold. Summer snowbirds and butterflies migrate south. Rain comes more often now, sometimes lasting for one or two whole days. The autumn leaves have fallen from the trees and lay in deep piles on the ground. On a windy day they swirl in the air like confetti. Daylight hours are getting shorter. Heavy frost begins appearing on the early morning grass. A light teaser snowfall may appear in November or early December. All of nature is preparing for the upcoming winter months. And so these beautiful garden grounds of the Charles Baber Cemetery have come full cycle through nature’s seasons. Each season is unique and spectacular to enjoy when seen through the eyes of the garden cemetery.